Western classical music is big business in South Korea, accounting for 17 percent of all record sales there by some estimates. Little wonder then that Universal has signed up the Seoul Philharmonic and several other Korean artists for the Deutsche Grammophon label. But, as this Mahler Five demonstrates, there is no need to invoke market forces to justify this orchestra’s appearance under the famous yellow banner. The string ensemble is tight, the wind soloists play with real character, and conductor Myung-Whun Chung delivers an interpretation of real power and insight. The recording is taken from two live performances in May 2014. Presumably DG is one of the few labels that can still afford to make studio recordings, but we should be thankful that they have chosen not to in this case. The thrill of the live experience is powerfully projected throughout: Nothing here ever feels routine. The audience is utterly silent, at least until the eruption of applause at the end. And sound quality is excellent, powerful and involving. Mahler is well served on high definition formats these days, and the inner detail you hear in the tuttis on the best SACDs (Iván Fischer’s cycle on Channel for example) is missing here. But it’s no great loss, as the warm, round orchestral tone that we hear instead is more sufficient compensation. Chung tends towards a more expansive Mahler, yet always retains a sense of discipline in his tempos and rubato. Paragraphs flow, well shaped but uninterrupted, while important junctions are well defined, especially sudden tutti interjections, which are always given their full dramatic weight. He is particularly good with pregnant pauses, setting them up well as the orchestra fades away or discreetly cadences, and then holding the moment, often just a little longer than you expect. He goes too far at the end o of the first movement though, holding back the final pizzicato so long that you think you, or he, has missed it. The Adagietto times in at 11:28. That’s one of the slowest on record, yet it never feels labored. Chung carries the line beautifully, with continuous subtle inflections of tempo and tone. 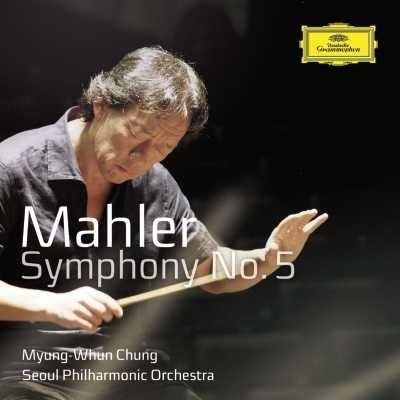 The strings of the Seoul Philharmonic lack the velvet elegance of the best central European ensembles, but they have a different identity, and it serves Mahler just as well. It is a round, clean sound, precise but never dispassionate. It is a valuable asset, and it’s what gives this orchestra its specific identity. No doubt Myung-Whun Chung, who has been leading the orchestra for a decade, is an important aspect of that identity too. He and the orchestra appear to be mid-way through a Mahler cycle: Symphonies One, Two, and Nine are advertised in the liner. DG is hardly short of Mahler symphony cycles, with a catalog that also includes Kubelík, Abbado, and Bernstein. Myung-Whun Chung and the Seoul Philharmonic need not fear comparison with any of those august figures.